New grants from the National Science Foundation will extend and improve two long-term climate observation programs led by BIOS scientists. For the next five years, a grant awarded to BIOS scientist Ruth Curry will support continued data collection aboard the container vessel Oleander, and transfer leadership of the long-term monitoring program to her. As the Oleander travels back and forth between New Jersey and Bermuda on its weekly shipping route, special instruments installed and maintained by scientists collect data across the New England shelf and slope, the Gulf Stream current, and through the swirling eddies of the Sargasso Sea. The monitoring was initiated in 1992 by scientists from the University of Rhode Island and the State University of New York at Stony Brook, and supported by the U.S. National Science Foundation (NSF) and National Oceanographic and Atmospheric Administration (NOAA). The Oleander’s owner and operator, Bermuda’s Neptune Group, has played a key role in enabling this program to run and has pledged to continue to do so in coming years. It is essential to monitor changes to this dynamic region of the ocean, which impacts societally relevant issues such as coastal fisheries, regional weather, and global climate. The Oleander data has already provided unique insights into recent warming trends and shifting currents. With the new grant, Curry and her team will upgrade aging instrumentation aboard the Oleander, work to make the data more accessible for scientists, and help highlight findings from the program for public audiences. “The beauty of these measurements is that they provide regular, detailed snapshots of this area of the ocean, at a time when human impacts are becoming increasingly serious issues” said Curry. Likewise, detailed measurements made at BIOS’s Tudor Hill Marine Atmospheric Observatory have monitored chemical interactions between the atmosphere and ocean since 1988. Scientists working at the observatory in Bermuda have studied the atmospheric particles that influence climate, and the pathways of pollutants carried by winds from North America to the Atlantic Ocean. 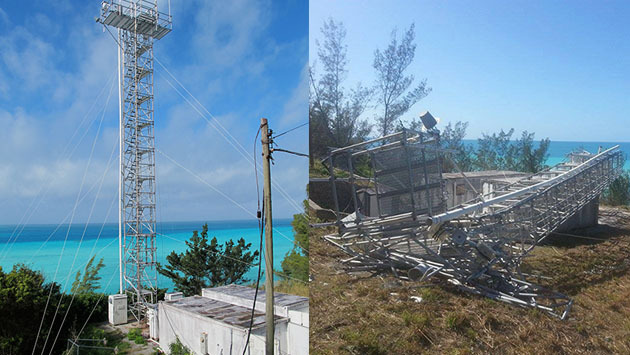 However studies slowed last October, when Hurricane Gonzalo tore down the 23-meter aluminum tower that provided the platform for atmospheric observations. A grant awarded to BIOS scientist Andrew Peters, who runs the Tudor Hill Observatory, will help install a new tower structure and expand the facility. In addition to the tower, a new habitation unit will provide on-site sleeping accommodation for up to two scientists, as well as washing, cooking, and dining facilities. With the ability to take a nap, prepare meals, or brew coffee, scientists can comfortably conduct experiments around the clock. Peters believes the upgrades will inspire new collaborations, and pave the way for more researchers to conduct experiments in Bermuda.